Every few weeks, Pj and I pack the kids up and take a short road trip to visit my parents at their home in the country. We love to go on nature walks or fish and swim in the river. Often times, my sister and her family come or other extended members of the family join us and it makes for a lot of fun...and a very full house!! My parent's country home is right next door to my grandparent's country home with a barn and pasture between the two. Although both houses have a lot of room for guests, we're all planning to fix up my grand parent's beautiful vintage Airstream as a mini guest house to sit between the properties. This darling sofa folds out into a 2nd bed. There's also a bed towards the back of the Airstream, near the bathroom. I love all of the original knobs and controls for the radio and kitchenette. It has a lot of work to be done on the inside, since the mice have gotten to it. The ladies will have a lot of long hours scrubbing and sewing and finding retro decor while the guys work on wiring and all of that mechanical stuff. When the hard work is over, we'll all have a really adorable camper to enjoy on the weekends and grandma even has a pair of original pink flamingos for the outside! 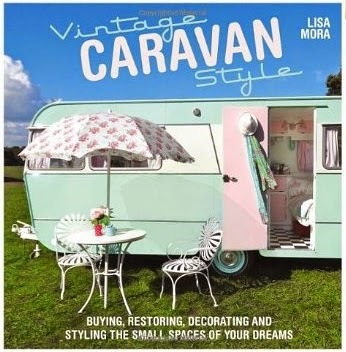 Throughout April and May, Sticth Craft Create is hosting the Vintage Caravan Style Blog Hop to celebrate the new book from Lisa Mora, Vintage Caravan Style. Lisa is the editor of Vintage Caravan Magazine. If you love glamping as much as I do, pop over to Stitch Craft Create to check out all of the vintage caravan features from my fellow bloggers this month, including some shots of their own caravans! 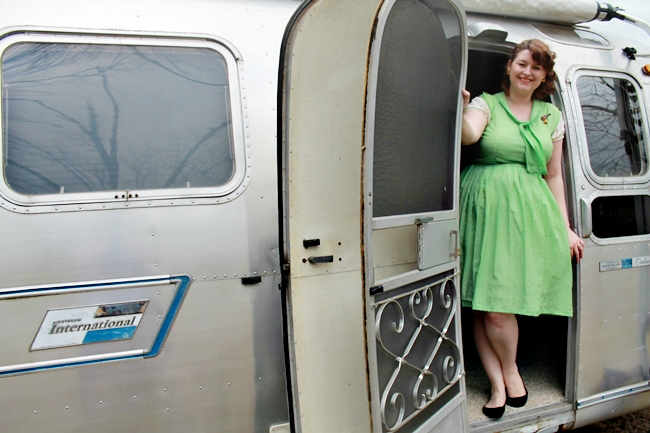 One Va-Voom Vintage reader will win a copy of Vintage Caravan Style. Please leave a comment with a way to contact you if you win! Entries open worldwide. The giveaway will end next Friday and the winner will be announced then. So fun! graham dot evie at gmail dot com. Darn, I thought you were giving away the Airstream! It's the perfect vintage backdrop. Love, love, love it! My hubby is a Marine getting ready to retire in 3 years; we hope to travel across the country with our daughters someday! Eeeeep! I LOVE these! My Aunt & Uncle had one they used as a lake cottage. It was sooooo cool! What a fantastic project! I'm sure it will be a lot of hard work but it will look so amazing when it's done. Good luck with it all. How delightful! I was hoping the Airstream was the giveaway item, too. What a wonderful way to travel! My daughter and I would love owning a caravan! It's so much fun looking at the different ways the owners have decorated their caravans. Please enter me in the drawing for the book. Have a wonderful weekend and a Happy Easter! ps. I love your dress! The shade of green really says spring! I have a huge pinterest board filled with glamping ideas. jessieheninger@hotmail.com. Yes please enter me! I've always loves vintage Airstream campers and it's a dream of my husband and I to one day have our own fixes up to take camping. So until we can afford one, this book would be amazing to have. Thanks for having this open to people all over the world, very much appreciated! Hope you had a fabulous time away. We want a vintage camper so bad! Someday we hope to be glamping with the best!! Love your site! Oh my take my breath away!!!!! What a treasure that trailer is!!! Bought my new 59' streamline 2 months ago:) love her & a 58' Santa fe' last night shhhhhhh...;) so excited about this book never seen it! Great giveaway doll! Love it! I went to a car show a few years ago and loved checking out the vintage caravans. I love the Airstream! Please keep us updated on your progress! How fun is this book. My dream is to own a vintage glamper some day. Thanks for the chance on your wonderful blog. So exciting! 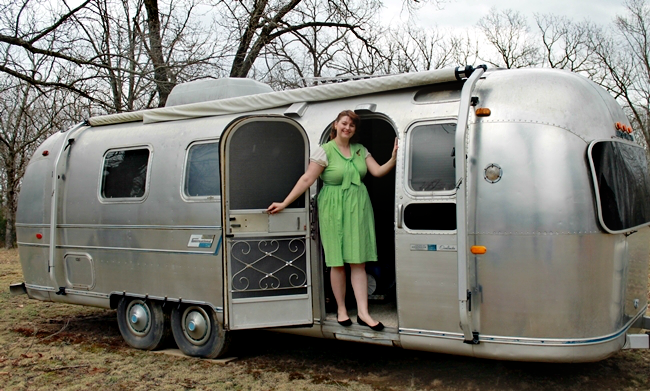 I dream of one day refinishing a vintage teardrop camper or airstream! Charmingly lovely giveaway!!! I want a vintage caravan like this soooo much (if only to pose with for photo shoots as you've done here, looking so beautiful in your springtime perfect green dress, may I add), too. They're just so fun, cheerful and reminiscent of how road tripping used to be. Oh how I love that Airstream!! And you look fantastic! Please enter me in the giveaway. I would love to win this book. You blog is awesome too. Thank you for this lovely post and giveaay! I love your dress!so cute in theses pictures! Love it!Lovely giveaway,thank you for the chance to win it. Love the Airstream. We have been looking for an older one to fix up. They are just so classy. Thanks for the giveaway! OH how cute!!! I would love to have an Airstream. Can't wait to see what you do with it!